Trade Show Booths are an extension of your miniature artistry. But how do you get customers to buy? Where do you place your products? When customers arrive what do you do next? How long will it take for them to purchase? Why would they choose your booth over someone else's? 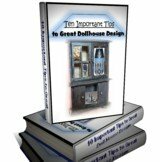 Attending "the most desired" Dollshouse Shows of the Year? Participating in Artisan Shows can be the most rewarding yet challenging way to market your Dolls House products. Customers get to meet and talk with you personally. Long before they set eyes on your products, though, they see your display. Is it eye-catching, inviting, and complementary of your products? Does your display add to what you are trying to accomplish or take away from it? Think in terms of your display as an extension of your artistry. Don't be in a rush to develop your long-term look. Let it develop on its own. Ask friends and customers to help with ideas. The basic table top display is more for small miniature products. Using multilevel effects with your table top displays will add greatly to this display idea. Peg board designs are an added resource with any table top display as well. The use of cloth to cover small boxes is another idea for helping to create a multilevel exhibit too, where table top displays are concerned. One can also use any number of tables in any size required to help in your desired look. Tables such as small folding aluminium tables, card tables, and snack tray tables add in creating character. With card tables for instance, one could demonstrate to your customers any personal design techniques used in creating your unique miniature products. If you yourself are the artisan. While designing your unique trade show booths keep an eye out for used craft displays. Someone selling their displays at a reasonable price could be just what you're looking for. Flea markets can be the ideal place to look for unique, creative ideas to showcase your products at affordable prices. Perhaps though, your Doll House business requires custom made displays. While this can be more expensive than some options, one could get part of it designed at one point and part designed at a later date. Begin with the most important part of your display and proceed from that start point. Create an environment where it will be easy to add new pieces to the display. Whatever you decide however your display must be portable. Always able to, and easy to, be moved. Your Craft display must be Portable Trade Show Booths. Make your trade show booths fun with the added incentives of contests, door prizes, small free sample promotional products, 10 minute miniature workshops and the 1000th customer served prize. Your unique ideas for promotion will make you a winner in the eyes of your customers. Special event giveaways in whatever form are real crowd-pleasers. These ideas should be at the top of your own craft event supplies list. Adding to the overall preparation success of your trade show booths. Visit the current trade show booths listings here. As well help people find your current tradeshow links by spreading the news about the sites you are listed on. For instance you can create your own page about your business and products on this site. Thus creating your own artisan event links.